I KILL GIANTS. (DVD Artwork). ©RLJ Entertainment. Twentieth Century Fox Home Entertainment presents the suspense-driven spy drama “Red Sparrow,” arriving on 4K Ultra HD, Blu-ray and DVD Tuesday May 22. This international spy thriller stars Academy Award winner Jennifer Lawrence as Dominika, a former ballerina forced to enter Sparrow School, a secret government program that thrusts her into a treacherous espionage game between Russia and the CIA. She emerges trained as a lethal agent, but is trapped in a world she desperately wants to escape. Francis Lawrence (“Hunger Games: Catching Fire,” “Mockingjay Parts 1 & 2”) reunites with Lawrence and directs an all-star supporting cast including Joel Edgerton, Jeremy Irons, Matthias Schoenaerts, Mary-Louise Parker, Charlotte Rampling and Joely Richardson in this edgy and provocative spy thriller. “Red Sparrow” is loaded with over 90 minutes of bonus material that takes you inside the making of the film, exploring real-life source material with the author, cast commentary, deleted scenes and more. 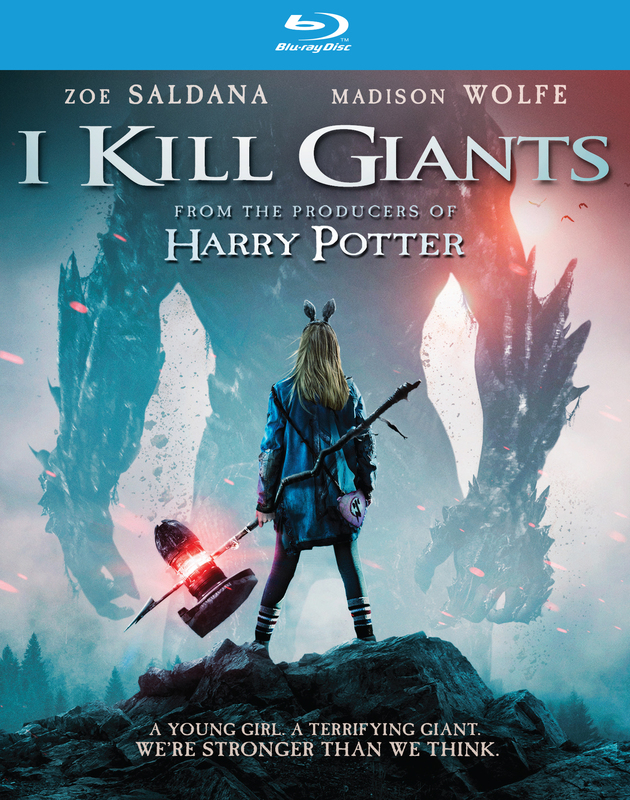 RLJE Films releases the adventure, fantasy film “I Kill Giants” on DVD and Blu-ray Tuesday May 22. 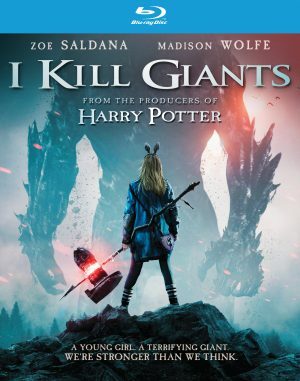 From the producers of the “Harry Potter” films,” I Kill Giants” stars Zoe Saldana (“Guardians of the Galaxy,” “Avatar”), Imogen Poots (“Roadies,” “Green Room”), Madison Wolfe (“The Conjuring 2,” “True Detective”), and Sydney Wade (“360,” “Una”). The film was directed by the Academy Award winning writer/director Anders Walter (“Helium”) and was written by Joe Kelly (Deadpool graphic novel, Big Hero 6 graphic novel, “Avengers Assemble,” “Ultimate Spider-Man”). “I Kill Giants” will be available on DVD for a suggested retail price (SRP) of $29.96 and on Blu-ray for an SRP of $29.97. Teen Barbara Thorson (Wolfe) is the only thing that stands between terrible giants and the destruction of her small town. But as she boldy confronts her fears in increasingly dangerous ways, her new school counselor (Zoe Saldana) leads her to question everything she’s always believed to be true. “I Kill Giants” is based on the critically acclaimed “Man of Action” graphic novel written by Kelly and Ken Niimura (“Henshin”). The graphic novel is the recipient of several awards including IGN’S Best Indy Book of 2008, New York Magazine’s Top 10 Comics of 2009 and the Gold Award at the International Manga Awards. The “I Kill Giants” DVD and Blu-ray include the bonus features “The Making of I Kill Giants,” Anatomy of a Scene, I Kill Giants Graphic Novel: Chapter 1 and a photo gallery. “Game Night” arrives Tuesday May 22 on Blu-ray Combo Pack, DVD and Digital. Jason Bateman (“Horrible Bosses” franchise, “Arrested Development”) and Oscar nominee Rachel McAdams (“Spotlight,” “Dr. Strange”) team up in the New Line Cinema action comedy. Bateman and McAdams star as Max and Annie, whose weekly couples game night gets kicked up a notch when Max’s charismatic brother, Brooks, arranges a murder-mystery party, complete with fake thugs and faux federal agents. So, when Brooks gets kidnapped, everyone believes it’s all part of the game. But as the six uber-competitive gamers set out to solve the case and win, they begin to discover that neither this “game”—nor Brooks—are what they seem. Over the course of one chaotic night, the friends find themselves increasingly in over their heads as each twist leads to another unexpected turn. With no rules, no points, and no idea who all the players are, this could turn out to be the most fun they’ve ever had or, it’s game over. Also starring are Billy Magnussen (“Bridge of Spies,” “American Crime Story”), Sharon Horgan (“Catastrophe”), Lamorne Morris (“New Girl”), Kylie Bunbury ( “Pitch”), Jesse Plemons (“Black Mass,” “Fargo”), Danny Huston (“Wonder Woman,” “X-Men Origins: Wolverine”), Chelsea Peretti (“Brooklyn Nine-Nine”), with Michael C. Hall ( “Dexter,” ”Six Feet Under”). “Game Night” was directed by John Francis Daley and Jonathan Goldstein, marking their second film as co-directors, following the “Vacation” comedy remake. The film was written by Mark Perez (“Accepted”) and produced by John Davis. “Game Night” will be available on Blu-ray Combo Pack for $35.99 and DVD for $28.98. The Blu-ray Combo Pack features a Blu-ray disc with the film in high definition, a Blu-ray disc with the special features in high definition, a DVD with the film in standard definition, and a Digital version of the movie. The unique story of three friends who became heroes unfolds in “The 15:17 to Paris,” which arrives on Blu-ray Combo Pack, DVD and 4K Digital Tuesday May 22. From Academy Award winning director Clint Eastwood, the drama tells the real-life story of three men whose brave act turned them into heroes during a highspeed railway ride. In the early evening of August 21, 2015, the world watched in stunned silence as the media reported a thwarted terrorist attack on Thalys train No. 9364 bound for Paris—an attempt prevented by three courageous young Americans traveling through Europe. The film follows the course of the friends’ lives, from the struggles of childhood through finding their footing in life, to the series of unlikely events leading up to the attack. Throughout the harrowing ordeal, their friendship never wavers, making it their greatest weapon and allowing them to save the lives of the more than 500 passengers on board. Anthony Sadler, Oregon National Guardsman Alek Skarlatos and U.S. Air Force Airman First Class Spencer Stone play themselves in the film. Starring alongside them are Jenna Fischer (“Hall Pass,” “The Office”), Judy Greer (“War for the Planet of the Apes”), Ray Corasani (upcoming TV series “The Long Road Home”), PJ Byrne (“The Wolf of Wall Street”), Tony Hale (“Veep”) and Thomas Lennon (“Transformers: Age of Extinction”). Paul-Mikel Williams plays the younger Anthony, Bryce Gheisar plays the younger Alek and William Jennings plays the younger Spencer. Eastwood (“Sully,” “American Sniper”) directs from a screenplay by Dorothy Blyskal, based on the book by Sadler, Skarlatos, Stone and Jeffrey E. Stern. Eastwood also produces the film, along with Tim Moore, Kristina Rivera and Jessica Meier. “The 15:17 to Paris” is available on Blu-ray Combo Pack for $35.99 and DVD for $28.98. The Blu-ray Combo Pack features a Blu-ray disc with the film in high definition, a Blu-ray disc with the special features in high definition, a DVD with the film in standard definition, and a Digital version of the movie. The film also is available on Movies Anywhere. Using the free Movies Anywhere app and website, consumers can access all their eligible movies by connecting their Movies Anywhere account with their participating digital retailer accounts. It also is available on 4K via digital retailers.